My God, this game is looking mouth-watering good. Calling it now, this will be one of the sleeper favourites of 2019 for many. Last edited by EvaUnit02; 29th January 2019 at 6:45 am. It's not really a metro game anymore, but it does look more fallouty than beth Fallouts. After watching IGN's game play video it sort of put me off. It does indeed look too Fallout-y, Where as the original two looked more STALKER-ish. I haven't played the first two, should i play them before picking this up? I loved STALKER and am kinda gutted this doesn't look similar but I'll take any post apocalyptic rpg I can! Yeah you should definitely play them especially Last Light. The books were even more depressing than the games! I could barely play the 1st game as it kept on bugging out on me for some reason. Well looking forward to this. It's survival/crafting mechanics look hella fun. This new game looks great but I agree with everyone else re: fallout style. Metro to me is underground with dashes across the surface. Looking good, yeah i like the outside areas, but some underground metro areas would be good to. Denuvo for PC confirmed. So that's a hard pass from me. We've already seen that the shitshow that is Denuvo undeniably adversely affect performance, loadtimes, etc. Which really is the last thing you need when a new extremely technically demanding title hit the platform. Well that's tarnished my want for this game. Good for you! Didn't ask. Why would anyone play a FPS on an inferior platform/control scheme if they have a better alternative. They've decided that PC players don't deserve to be respected. They don't deserve my money. I could not care less about what you do. ugh ..ok i guess i will pass and wait for no Denovu version. AH well, a real shame , will GoG have no Denovu? says the guy with a beast of a pc (in comparison to mine) . It would not have it, but I've not heard anything about it being on GOG. So I don't think it likely. Denovu wouldn't stop me from picking this up on PC. Didn't realise how many of the games I own run it. Hope they don't ruin the metro experience by opening the areas up too much. Deep Silver and THQ Nordic games find themselves on GOG eventually. Epic Store exclusive now. Existing Steam preorders will be honoured. Update: A later press release we received from Deep Silver explained that the game will return to Steam a year after release. 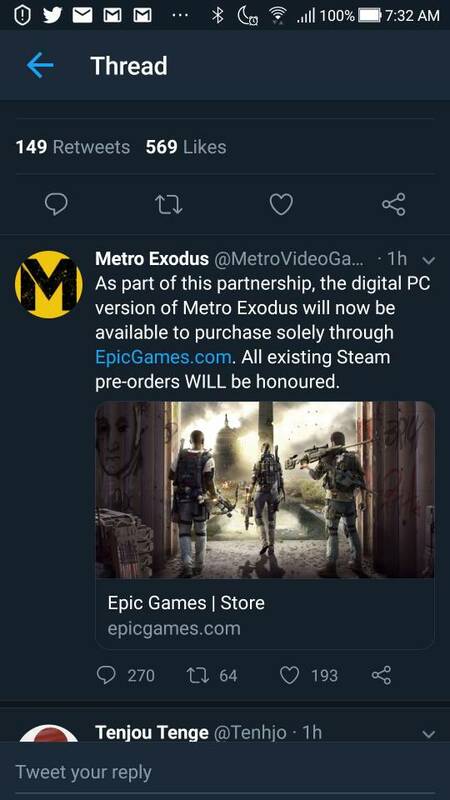 "Metro Exodus will return to Steam and on other store fronts after 14 February 2020."